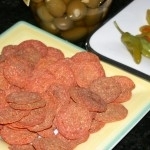 Super Simple Pepperoni Chips – Our Free Gift to YOU! Whether you are lifting a glass of bubbly, sipping red wine in front of a fireplace, or enjoying a beer during a favorite sports event on television, we have a Super Simple snack that is AWESOME! We absolutely love the spiciness of pepperoni, but we are not so keen about all the greasiness. I created these gems in the mid-1990’s. It was one of my first super clever recipes since Cheese Crisps in the early 1980’s. There are countless uses for Super Simple Pepperoni Chips… macaroni and cheese, garnishes, salads, casseroles, pizza toppings, snack chips, in rolls, on burgers, in eggs or quiche, etc. Enjoy ALL the flavor without the fat! Place 2 dozen slices of packaged, pre-sliced pepperoni on 4 layers of paper toweling. Top with 2 more layers of paper toweling. Store in sealed containers or plastic bags. They stay crisp at room temperature. KISS Variation: Microwave just 30 – 45 seconds to use on pizza, but without the excess grease. Partial cooking lets you double or triple up on the amount of pepperoni you load on your favorite pizza, but you don’t have to have pizza dripping with all that sloppy grease. If you would like more recipes like this one, simply write to us at QTPub123@aol.com. The inventory of exciting, original, and Super Simple recipes, books, and collections is constantly growing! You can find collections at Barnes & Noble, Amazon.com, and other sites. This entry was posted in Bubbly Makes the World Go 'Round. Bookmark the permalink.